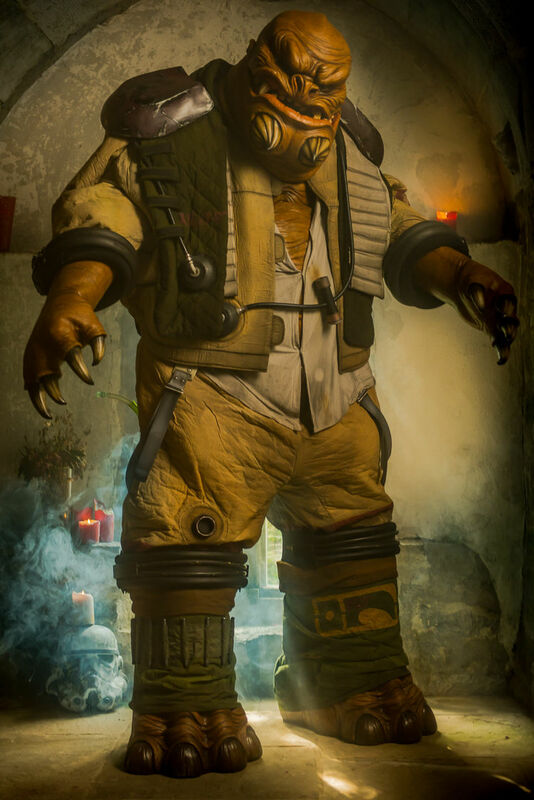 You might remember Grummgar as one of those cool background characters in Star Wars: The Force Awakens. He looks like a pretty bad dude and he’s huge. He was seen on screen lounging in Maz Kanata’s castle with assassin and First Order informant Bazine Netal. He is a gigantic mercenary. If you thought that was impressive, here’s is a gigantic 9-foot replica of Grummgar, complete with assassin, portrayed by model Valentina L’Abbate. The outfit was created by Julian Checkley of Order 66 Creatures & Effects in Galway, Ireland and was the cosplay contest winner at this summer’s Star Wars Celebration Europe. Obviously. There’s no way this cosplay doesn’t win. The details are just amazing.